The Royal Hotel, Fore Street, Devonport. Courtesy Plymouth & West Devon Record Office. the Royal Sailors' Rest and the Theatre Metropole. From Ordnance Survey sheet CXXIII.7, published 1935. 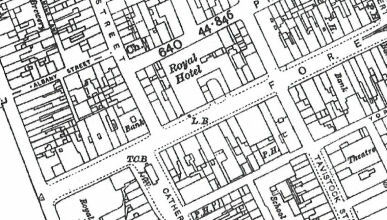 The Royal Hotel was situated at number 84 Fore Street in 1850 but between numbers 76 and 81 later that century. It was approached by a U-shaped driveway that gave access to the entrance. The Hotel contained the Assembly Rooms, where major functions were held. According to its advertising in 1939 it was then 200 years old, indicating that it was either built or opened in 1739. It must have been one of the earliest buildings in Fore Street and became the principal starting point for the mail and stage coach services. Mr William Elliott (1782-1857) was the man in charge here by 1830, when it was known as Elliott's Royal Hotel and was the starting point for stage and mail coaches to London. The Royal Hotel was badly damaged by fire in the early hours of Thursday March 12th 1840, which resulted in one death and the loss of all the belongings of the Hotel staff, a subscription being started to help them. At that time the Hotel was stated to be owned by a Mr Lyne and not by Mr Elliott. On Lady Day, March 25th 1844 the Royal Hotel was leased by Mr Robert Narcissus Moorshead (1803-1874), formerly of the Commercial Hotel in Plymouth. It thus became known as Moorshead's Royal Hotel. As a result of his continuing poor health, he offered the 40-bedroom Hotel for sale by auction on March 21st 1873, along with Underhill Farm, Stoke. He passed away on April 28th 1874, at the age of 71 years. Mr John Edman Parker (1839-1884) was the resident manager at the time of the census in both 1871 and 1881. He passed away suddenly in the Hotel on March 21st 1884 at the very young age of 45 years. Mrs Priscilla Parker appears to have continued to run the Hotel. 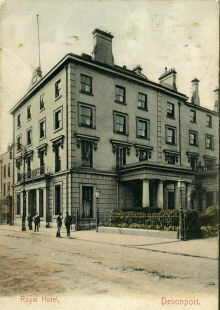 Sometime between 1890 and 1901 the Royal Hotel was acquired by Mr Frank Perrin Harrison, who was managing director of Messrs Harrison's West of England Hotels Limited. He was residing at the Royal Hotel at the time of the census in 1911. The Hotel was still under that Company's ownership in 1939, just a few years' prior to its destruction during the Devonport Blitz of April 1941. Mr Harrison died at Totnes in 1944, at the age of 75 years.